There is a member of my family who suffers from atopic dermatitis. The gentleman in question gets a bright red rash on his entire neck area at the slightest irritation (even his own perspiration regularly triggers a reaction). He even has to be mindful of which fabrics he wears and has lived with this condition for much of his life. 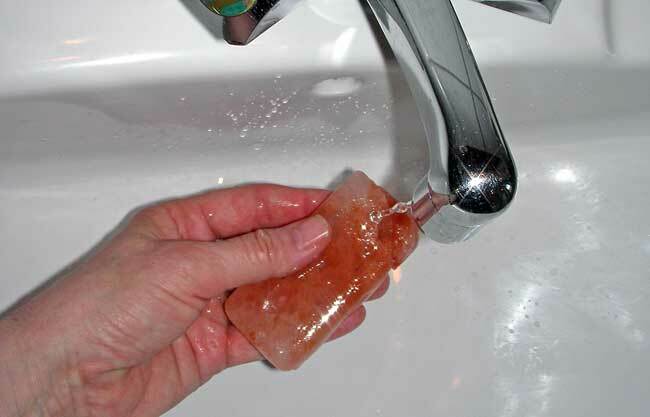 Several times, I have mentioned to him that his skin might react well to using a Himalayan Crystal Salt bar and offered to set him up with the salt treatment I do every day. At every occasion, the reply has been a polite but firm 'no thanks' with a tone that clearly indicated he viewed my comment as if it I was suggesting he try some kind of voodoo involving ancient rituals and dead chickens. Now, I realize most men aren't big on talking skin care, but this fellow has been particularly resistant. To be fair, he is very mindful of which products he uses, so I can't in all honesty place him in the 100% stereotype 'guys can't be bothered with skincare' slot – but he has been brick-wall resistant to my suggestion of using salt. This summer, he and his wife treated themselves to a spa-weekend where he experienced a salt pool treatment for the first time. Although his immediate reaction to the super-salty water was redness and a slight stinging on his neck, the redness soon dissipated. Subsequently, his neck was unusually calm and rash-free for several days (I was duly informed by a secret undercover agent who was on the scene). 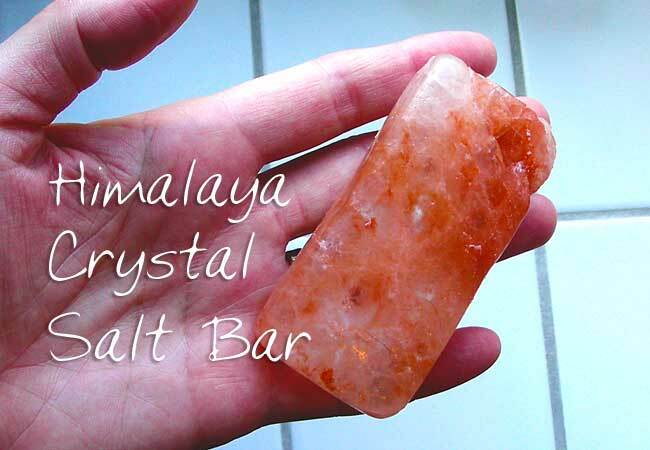 Here is a Himalayan Crystal Salt Bar. Pink. Pretty. (The pink is due to a content of iron oxides, but let's just enjoy that color for a moment, shall we?). To use: Wet the bar. Rub it between your hands. The salt will dissolve a bit and leave you with a salty solution. Apply the salty solution to your skin. The next part is very important: let your skin AIR DRY. For super soft luxurious skin deliciousness, try finishing with a light layer of body oil. I normally use the bar at the end of my morning shower. And, although it will work just fine with plain water, I use my own skin tonic (mandatory for anyone who belongs to the Creature of Luxury Club). This combo is an easy instant daily body lotion that functions well for summer months. 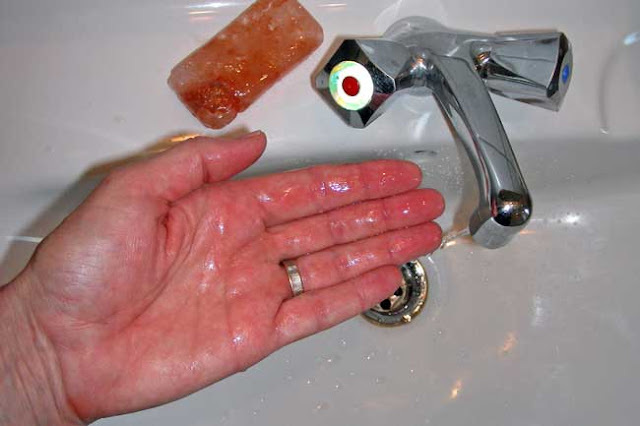 Tip: do not be tempted to apply the bar directly to your wet skin unless you like brushing salt crystals off of your skin and the inside of your clothes. Among other things, the magnesium in this salt improves hydration and helps reduce inflammation. 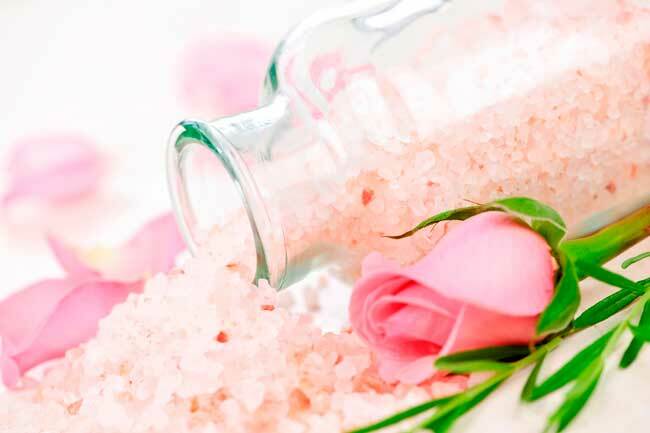 Himalayan Crystal Salts are touted as having the richest mineral content and being the planets purest. I've been digging around for evidence of some of the claims attached to Himalayan Crystal Salt and have – so far – been unable to find scientific documentation on any of it. One of the standard claims is that it contains no less than 87 minerals. Wikipedia writes that a Bavarian Consumer Protection Agency test in 2003 found only 10 minerals present. the reference page Wikipedia links to is a dead link. In short, I'm just not sure who's right. I can say for certain that it has worked beautifully for my skin for many years. It also seems to be doing an excellent job on the family member 'who finally came around' and now uses it daily. There is some study on the benefits of mineral-rich salts for skin ailments, and this article, by the International Journal of Dermatology, shows that it does help and even improves skin barrier function. Have you ever tried using a salt bar? Did it benefit you? I hope google translator is of any use here. I have a patch behind my ear that has really improved with using the salt bar so thank you for that as I was at my wits end and have been reluctant to go to the doctor for something so minor. I wonder though if I am drying out the area too much as it's rather scabby, although that is likely to be due to the overwhelming desire to scratch every now and then! Would a balm or emulsion with salt be better and have you ever made one? Hi Anna - Thanks for your comment. I have never made a balm with salt but you could try gently applying a pure unrefined shea butter over the area directly after using the salt. Best of luck with it!